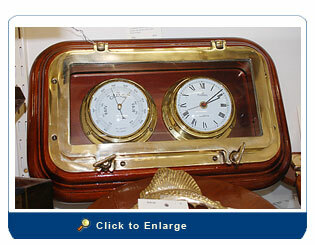 This is a solid brass, real porthole… we know it is old because of the bubbles in the glass. The frame was custom made from Honduras Mahogany. The thickness of the wood also tells us that this is a very old piece (you can't get mahogany like this any more... it is over 2" thick). It is our guess that what ever the porthole/frame originally housed wore out and the clock and barometer were substituted. The clock is quartz and keeps good time. The clock/barometer brass cases are in real good shape. The barometer needle moves but we are not sure if it is accurate (we didn’t try to adjust for our location). We completely restored this piece. The Mahogany was stripped and three coats of hand rubbed spar varnish was applied. This is an original, unique, antique piece.